Years ago, when I had just graduated from college, I lived with my friend Nancy. Nancy was a fantastic roommate, and she had just one quirk: her food jags. Like a little kid she would often go for weeks eating only one food. First it was lobster ravioli, then orange glazed salmon, then blueberry oatmeal. Always delicious, usually nutritious, but monotonous. And once a food jag was over, Nancy would declare herself tired of the food of the month, and move on. To this day, she has not eaten another lobster ravioli. 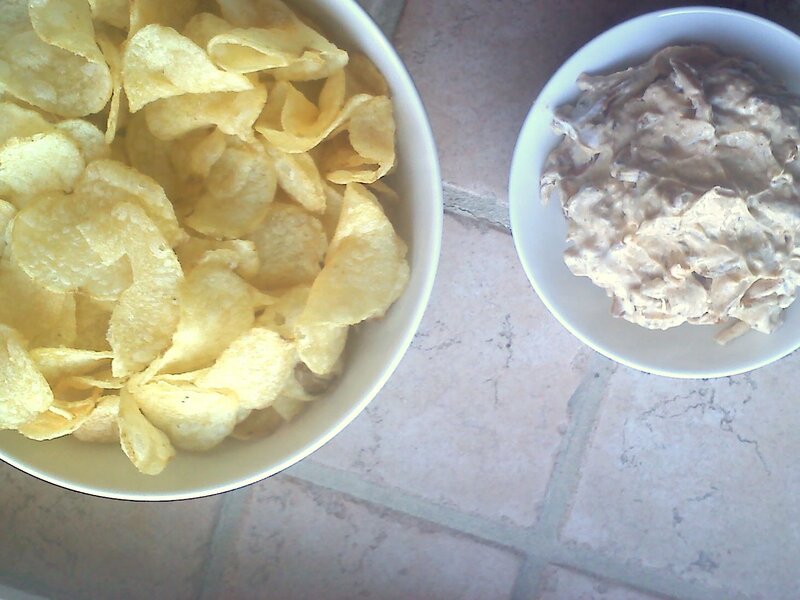 If I were ever to go on a food jag, onion dip would be it. For as long as I can remember I have adored the simple Lipton’s onion soup and sour cream standby. 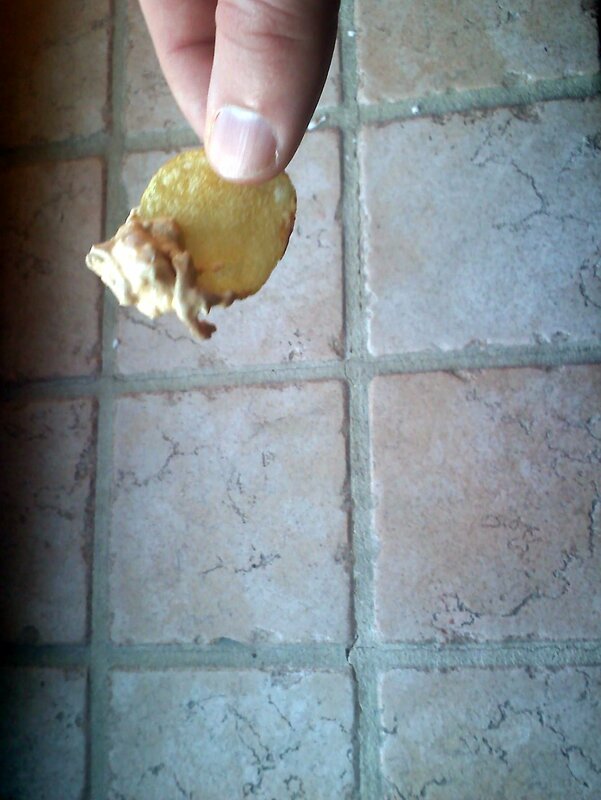 It was on my grandmother’s coffee table, along with a big bowl of Ruffles potato chips, at every family function. It was the prelude to every BBQ at my parent’s beach house. I never believed that anything could be better than the salty, creamy deliciousness. Which is why I hadn’t bothered to make my own onion dip from scratch. Until today. And I’m never going back. As much as I thought I loved the simple mixture of Lipton’s and sour cream, this is twice as good. Rich and buttery, deeply flavorful and still so creamy, this dip is perfect with the salty crunch of a potato chip. It’s onion dip – but better. And while it takes a few more minutes to make than the packaged dump and stir, it’s really so simple. Just cook the onions until wonderfully golden, and then whip them into a creamy base of mayonnaise, cream cheese and sour cream. I made this dip two days ago expecting to enjoy just a few bites as a snack, but we ate the whole bowl for dinner. And I couldn’t stop thinking about how delicious it was… which lead me to make it again today. I feel my first food jag coming on, but I’m fighting it. 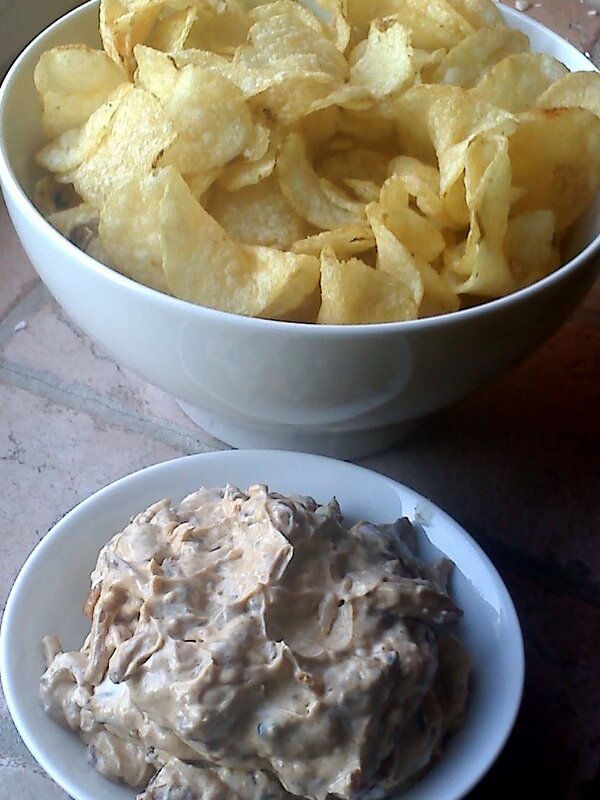 While a month of sweet and savory golden onion dip sounds divine, I don’t want to get tired of this dip. I want to savor it, swoon over it, and enjoy. This dip would make a great addition to your Oscar-watching spread tomorrow night, but it’s pretty much fantastic anytime. And if you happen to have any leftover (unlikely), this dip is actually great as a sandwich spread, and is particularly awesome with roast beef. Peel the onion and slice in half. Slice the onion into thin half-moon slices. Warm the butter and oil in a skillet over medium heat and add the onion. Stir in the paprika and salt and pepper. Saute over medium for 8-10 minutes and then reduce heat to low and cook for 10 minutes more, until the onion is soft and brown. Cool slightly. Meanwhile, whip the cream cheese with an electric mixer. Whip in the mayonnaise and sour cream. Stir in the onions and season to taste with salt and pepper. Chill at least 30 minutes, or overnight. 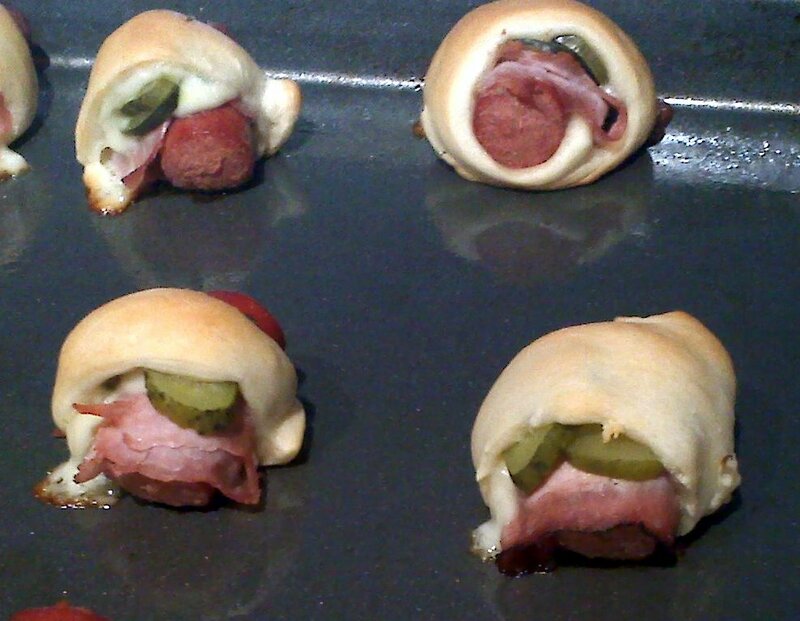 Serve with potato chips or fresh cut up vegetables. I found an old copy of M.F.K. Fisher’s An Alphabet for Gourmets at the library a few weeks ago. It took me a while to get through, not because I put it down in favor of other pursuits, but because it’s simply a lot to digest. Every sentence, even every word, of Fisher’s writing carries a weight, a history. Having read The Gastronomical Me a few years ago, I had forgotten how she manages to pack so much literary grit into a meal. One word struck me in particular. Fisher uses the word ‘honest’ in vignette after vignette to describe anything from bread to soup to an entire repast. Honest bread. Honest borscht. What is honest? Is this an old-fashioned turn of phrase, a colloquialism? Would Mary Francis Kennedy have wondered at my use of the word ‘cool’ thinking that I must have an obsession with chilled food? Or is honest food really a philosophy of gastronomy? And if so, what qualifies as honest? Simple, beautiful tomatoes grown in the backyard must be honest; upfront, origins known, nothing to hide. The fresh little quahog clams my brother brings in from the Rhode Island shore seem honest, they are straightforward and best enjoyed simply steamed and dunked in a bit of salty butter. And I have to wonder, if there is honest food, is there dishonest food? I suppose that fast food burritos stuffed with meat of suspect provenance might be considered dishonest. So-called healthy snacks, stripped of fats and stuffed with sugar and unpronounceable chemicals… those are perhaps a bit deceitful. But overall, I think what Fisher was praising was the basic authenticity, the traditional wholesome nature of the most humble dishes. In an era when condensed soup, lily-white sliced bread and flavored gelatin were all the rage, she advocated for simple, thoughtful meals. As I was punching down bread dough this morning, I couldn’t help but wonder if my bread would have passed the honesty test. 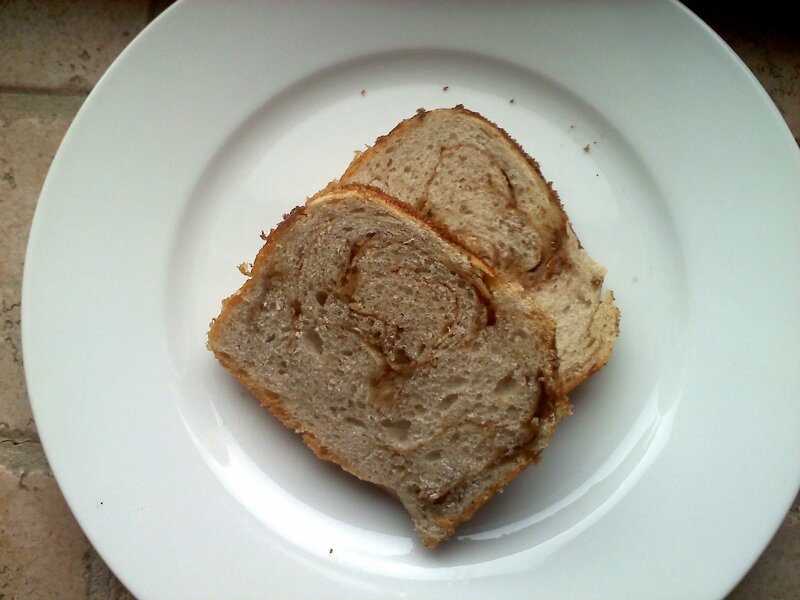 The thought nagged at me until I started to smell the cinnamon wafting through the kitchen as the bread baked. A thick slice of cinnamon toast, slathered with good sweet butter, has to be as honest as it gets. To my mind, ‘honest’ conjures images of a warm and homey kitchen, a place filled with the scent of cinnamon and plenty of laughter. A place to sit, with a cup of tea, a slice of cinnamon swirl bread, and someone you love. Stir together the water, yeast and sugar and let sit for 5 minutes. Stir in 3 teaspoons of oil, the salt, and both flours until a ragged dough forms. Turn out the dough on a floured surface and knead to a smooth ball (about 5 minutes of kneading). Place the dough in a greased bowl and let rest in a warm place for an hour. Punch down the dough and then pinch it into an 8 inch square. Mix the brown sugar, cinnamon, and nutmeg together in a small bowl. Spread all but two tablespoons of the cinnamon mixture evenly on the dough. 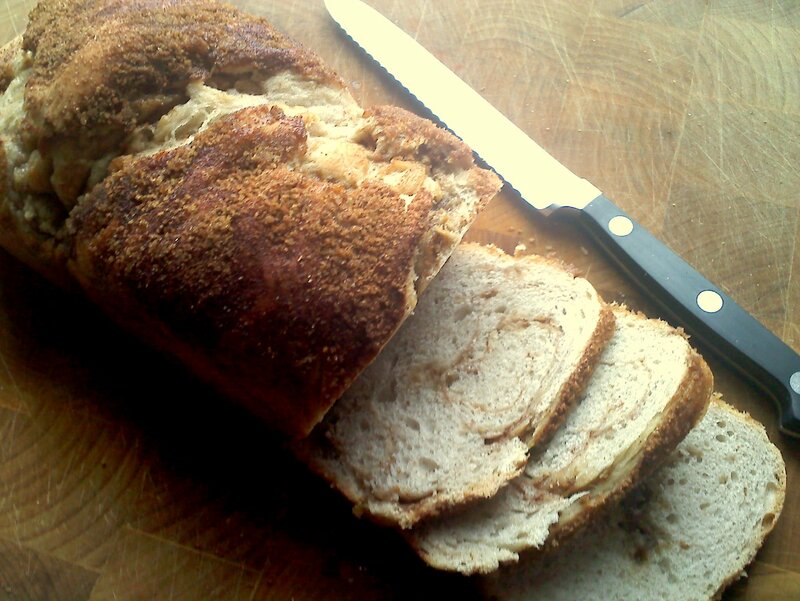 Roll up the dough jelly roll style and transfer to a greased loaf pan. Allow the dough to rise again in a warm place for about 45 minutes. Preheat the oven to 350 degrees. Brush the top of the dough with the remaining teaspoon of oil and sprinkle with the reserved cinnamon mixture. 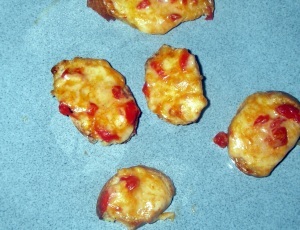 Bake 35 to 40 minutes until lightly browned. Cool before slicing. I love brownies, ice cream and potato chips as much as the next girl, but my absolute favorite dishes are both indulgent and healthy. Of course, for me healthy is a fuzzy category, less about calories and more about how they feel in my body. But foods that taste good and feel good are double winners. Creamy Greek yogurt with sweet, fragrant, local honey is high on the list of my most desired breakfast items. And there is nothing like pulling apart a steamed artichoke, enjoying each succulent leaf. 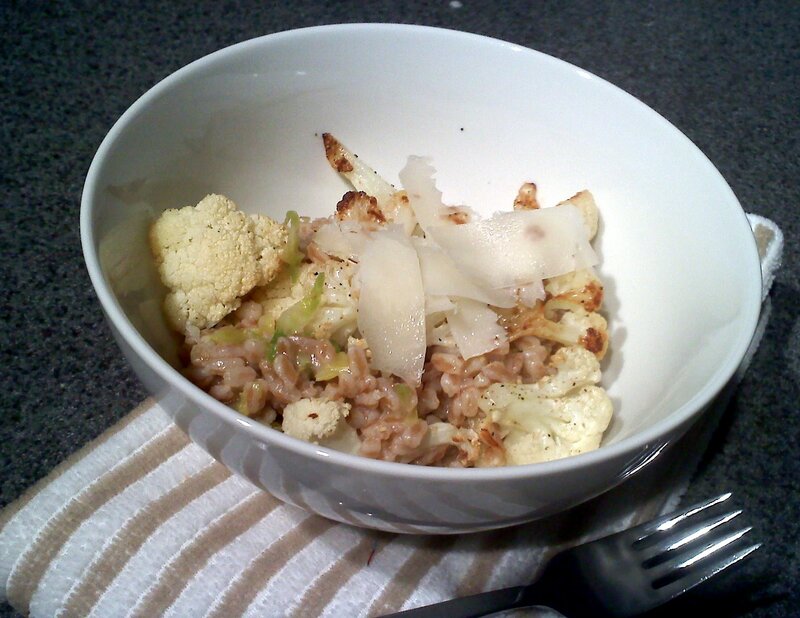 Roasted Cauliflower with Truffled Farro certainly falls into both the indulgent and the healthy categories. I adore roasted cauliflower, simply browned with just a bit of salt and pepper, the nutty flavor of the little florets is addictive. And who can argue with the unique, heady flavor of truffle oil? It does wonders for the simplicity of farro. If you haven’t experimented with farro, I highly recommend it. The bite of the nutty grain is lovely in warm, hearty dishes like this, but also works well tossed in salads and soups. Preheat the oven to 400 degrees. Chop the cauliflower into florets. 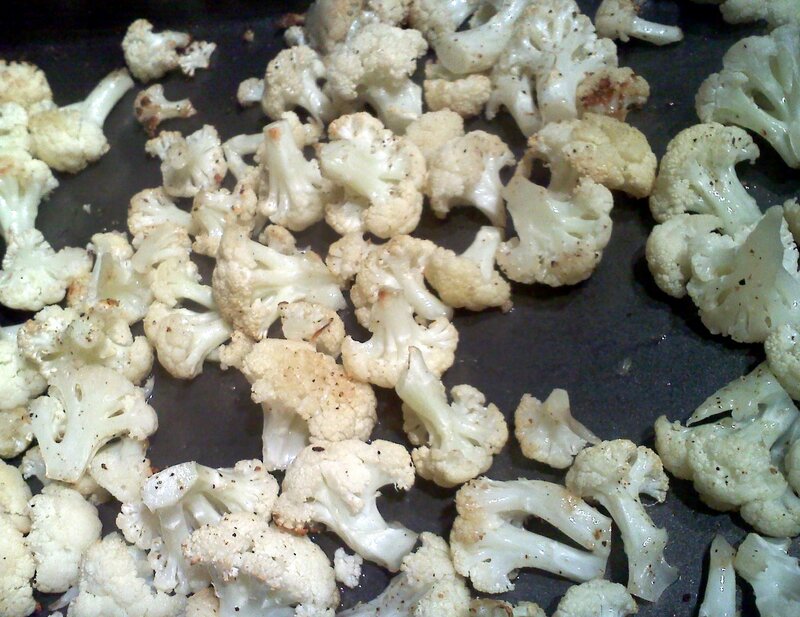 Toss the cauliflower with the olive oil, salt and pepper. Spread the florets on a greased baking sheet and roast for about 20-25 minutes until edges are brown. Meanwhile, bring a large pot of salted water to a boil. Add the farro, onion, celery and carrot and cook about 25 minutes, until the farro is tender but firm. Drain the water and discard the onion, celery and carrot. 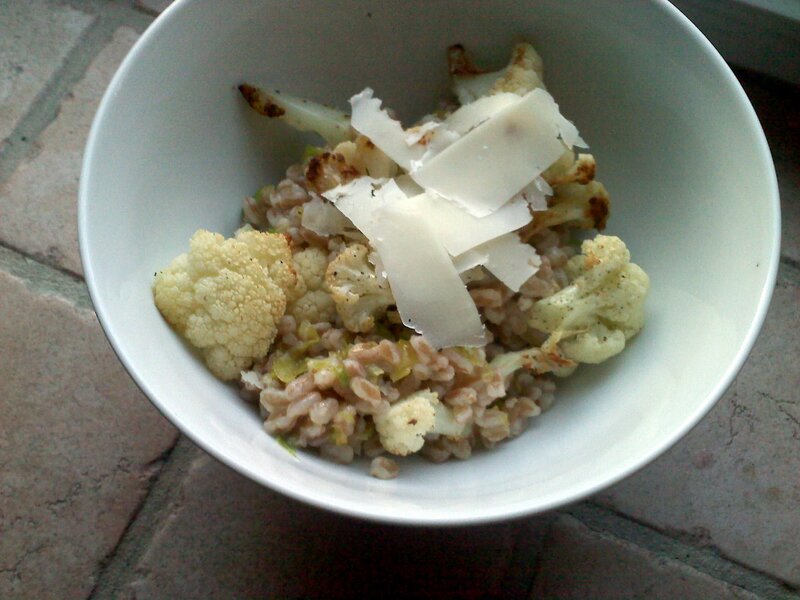 Toss the farro with the lemon juice and the truffle oil. Add in the cauliflower and salt and pepper to taste. Serve topped with the cheese. What do you do with leftover cake? I know… who has leftover cake? Does that exist? Let’s just pretend that it does. Willing suspension of disbelief, ok? Because if you had leftover cake, you would just have to make these wonderful cake ball ‘truffles’. And then you’d have to eat them all, because wasting food is bad. I suppose you could share them with your Valentine, but I wouldn’t. I’d eat them myself. But that is because my husband doesn’t like white chocolate – his loss! More for me! In all seriousness, however, they do look very pretty packaged up in a little box, and they make a great homemade gift. As my cousin Ethan put it, his mouth half full of cake truffle, “Little Debbie should make these.” I think it was a compliment. He does like Little Debbie. And these truffles are quite addictive. 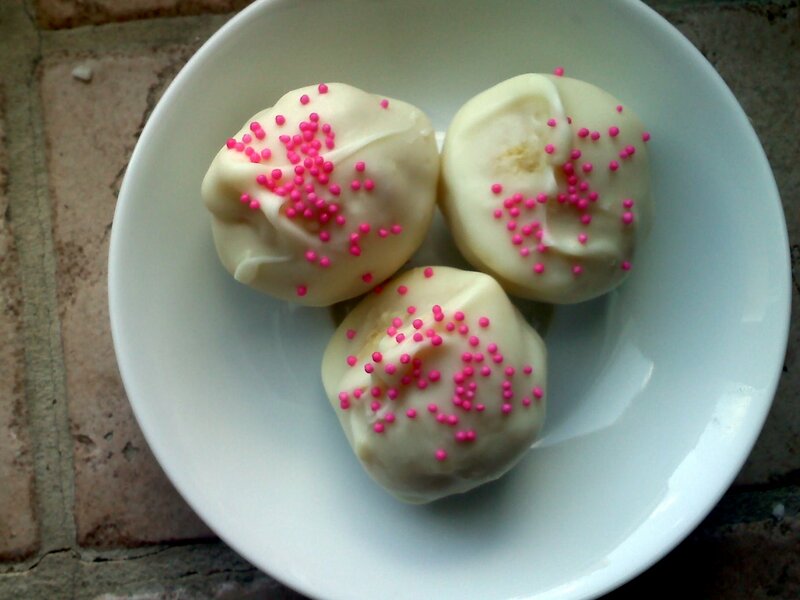 They aren’t technically truffles, they are really just balls of cake and frosting covered in white chocolate. But the surprising taste and texture makes for a double dessert experience in one bite. Most often when I make cake ball truffles I do actually make and frost a cake. We enjoy the cake for dessert one night, and the next day I smash it all up and roll it into balls for the truffle centers. You can certainly skip right to the truffle making, but do be sure to let the cake cool completely before mashing with the frosting. And if, like Jeff, you don’t enjoy white chocolate, just use milk or dark chocolate for dipping instead. A word here about the cake and frosting: You can make your own from the recipes suggested below or you can choose to go with the boxed and canned variety. But if you decide to split the difference, do me a favor and make the frosting. I have to admit a weakness for boxed cake mix. My grandmother passed her fascination on to me. But frosting in a can I can do without. Although store-bought frosting would probably make them taste all that much more like Little Debbie! Crumble the cake into a large bowl. Using a large fork, mash the frosting into the cake until well combines. 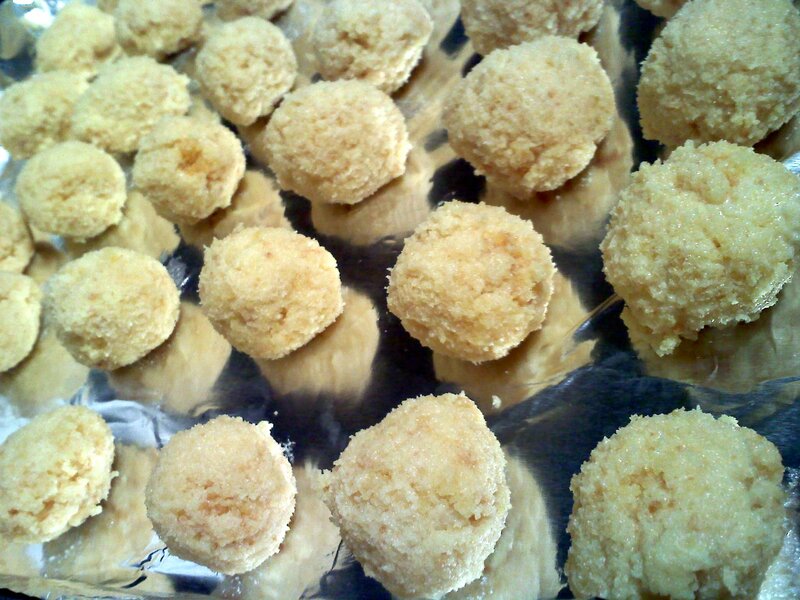 With your hands, roll the cake mixture into 1-inch balls. Arrange the cake balls on a wax paper-lined baking sheet and refrigerate for at least an hour. Melt the white chocolate in 20 second bursts in the microwave or gently in a double boiler. Stir until smooth. 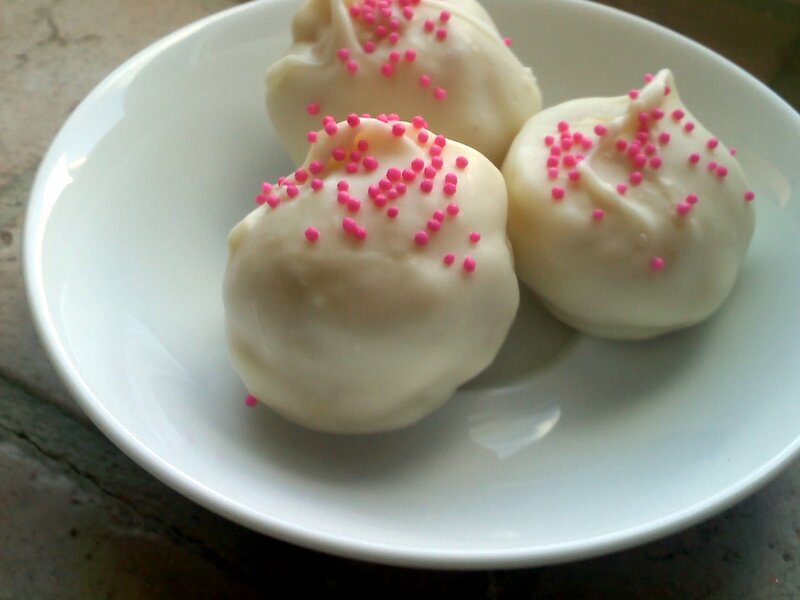 Dip the cake balls in the chocolate, shake off the excess, and place on a clean piece of wax paper. Top with sprinkles. Let harden at room temperature. Store in a cool place in an airtight container for up to 3 days. After making Mac ‘N Beer Cheese Soup last week, I told you all that I had a Steelers-inspired recipe up my sleeve as well. And I did. Did you know that Klondike Bars were invented in Pittsburgh? I figured that after a hearty soup, a Super Bowl dessert was in order, and I set out to make my own Klondike Bars. But this was one of those weeks when my kitchen was just crawling with bad juju! The grocery store was out of my favorite brand of ice cream. My first batch of chocolate seized up when a water droplet invaded the bowl (water and chocolate do NOT mix). After buying a second batch of chocolate chips, I stupidly turned my back on the double boiler, and the chocolate burned. After a third trek to the market, I attempted to coat squares of ice cream with what I had envisioned to be a fool-proof method. Wrong! Melted ice cream and drippy chocolate flowed over my counters and into the sink. 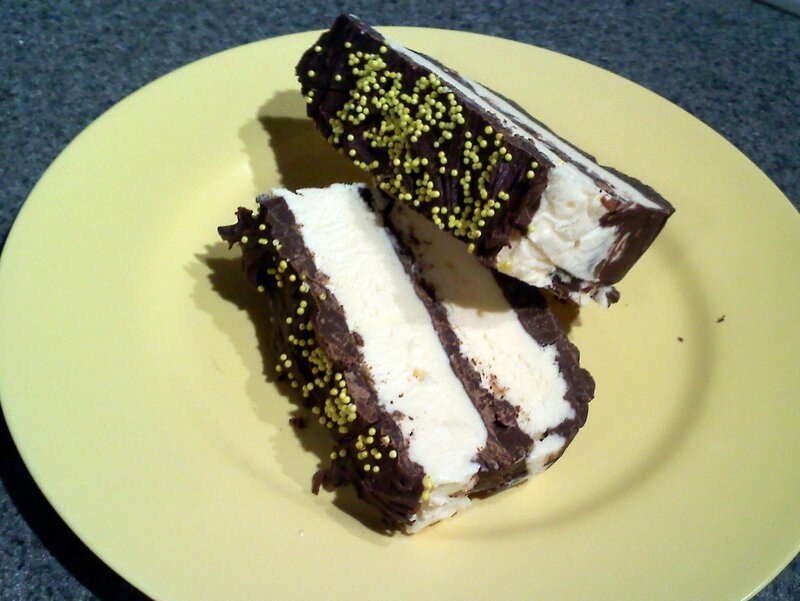 Not one to waste good sugary ingredients, I spread the remaining melted chocolate and bricks of vanilla ice cream in layers in a loaf pan, topped it with gold sprinkles in a sad little Steelers gesture, stuck it in the freezer, and gave up on the Klondike Bars. I have to admit, the frozen Klondike Loaf is really tasty, but even so, it all seems like a bad omen for Pittsburgh tomorrow. I’m sorry to all of you Steelers fans, but the juju doesn’t lie. Pimento Cheese Toasts are so simple, and such a huge crowd pleaser! 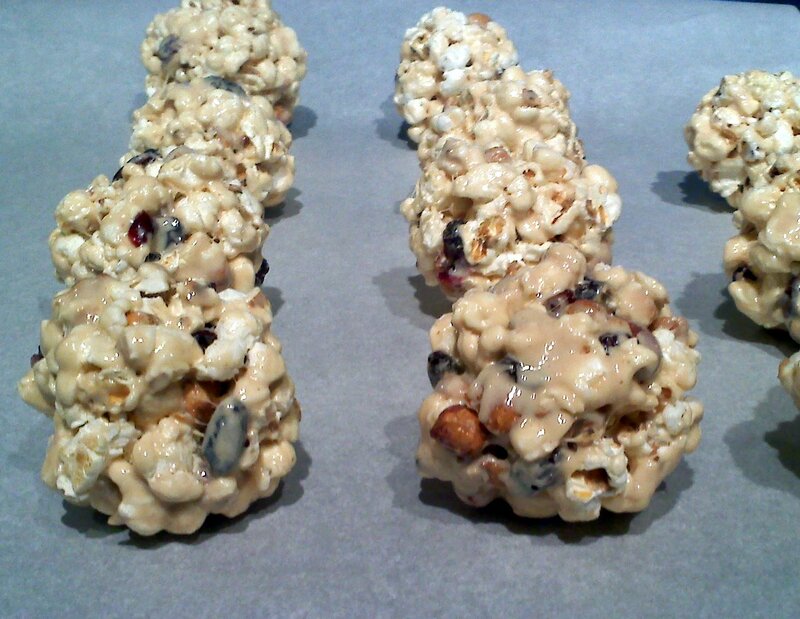 Popcorn balls are so easy and quick to make, and so fun and sticky to eat! The Cubano Piggies I told you about a couple weeks ago are fantastic, unexpected bundles of yumminess! 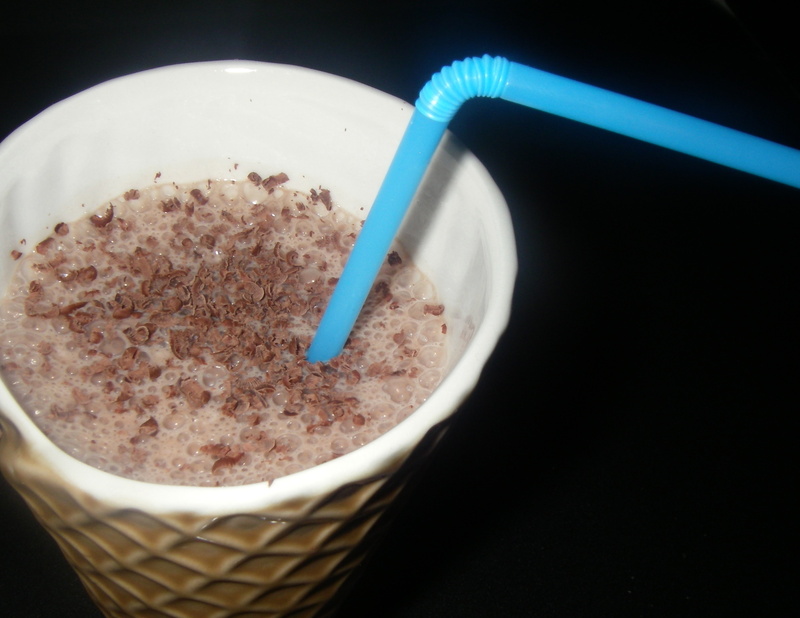 Nobody has ever turned down a chocolate malt!